A voluntary blood donation camp organised on 13th Oct’2017 under the aegis of 26 Bn BSF at Unit Hospital, Praharinagar, Tura in collaboration with blood bank department civil hospital,Tura. The blood donation was supervised by Dr. S K Marak, Pathologist, In-charge blood bank, Dr. T A Momin and Dr. D R Marak and other staffs from blood bank, civil hospital Tura were present during the camp. More than 25 sentinels of border and five members of their families donated blood. 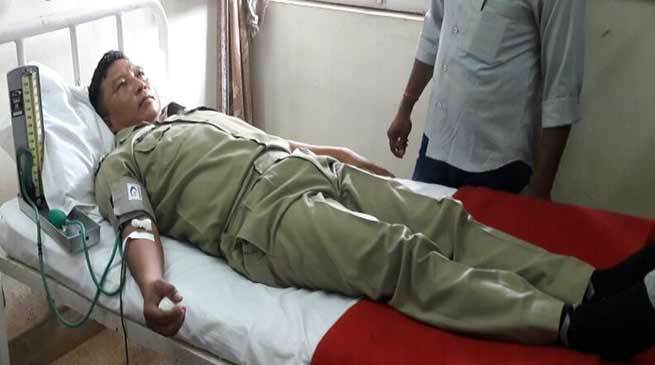 Dr. Dhirendra Kumar, Medical Officer of BSF Praharinagar Hospital and other staff of the Hospital assisted the blood bank staff in smooth conduct of blood donation. Sentinels of International border of Meghalaya, who are not only serving at border in extreme hard conditions but also putting efforts to contribute for the social cause. In the past, Border Security Force has been also conducting various Blood donation camps, free medical camps, civic action programme for border population.